-Another F@CKED Borrower- casualty of the housing bubble: "We sort of count our equity loans as our income"
I think this part of the "story" says it all...but read the whole thing. Sacco estimates that along with McCook's mother, who has been a silent partner, they've made $1.3 million since they began their buying spree, but all of this is still in equity on their properties. Their monthly reality is more sobering. They have $2.3 million in mortgage debt and negative cash flow that ranges from $5,000 to $15,000 monthly depending on the season. So how do they pay the bills? Now THAT is a statement to remember!!! Loans count as income! AMAZING!!! I'd just LOVE to be the investor holding that paper. Since I'm writing almost all of my own content and not just copy/pasting from the internet, it takes time. I really appreciate the feedback that people have given me so far. It really motivates me when I know that people are benefitting from reading this blog. It is not easy writing your own content, and it takes time to make it informative, easy to understand, and entertaining. So how am I doing?!?!? I want to hear from you lurkers as well...go ahead and post anonymous comments, or make up a name and post. That said, what would you like to see next week? I know that people like the FB scenarios, and I will keep them coming. What else is weighing on your mind in regards to the mortgage/real estate markets? I'll do my best to answer your questions. I hope everybody has a great weekend...I know I will! I look forward to the feedback when I return! When the music stops, these people will have no chair. Could you do an analysis showing IO and arm by region as a proportion of loans by year. Or is that beyond your ability? I have heard conflictiing #'s on the IO and other exotics. Maybe I am looking in the wrong places. BTW I know someone who works for Cendant and as you may know they are the dominat broker in the southland in CA. He claimed it was approaching 80% but I ahven't seen anything to corroborate it. It is tough piecing those stats together. Just know this...the higher priced the areas, the more ARMS, I/O, and option arms are being used. Trying to beat the SoCal traffic this afternoon! The only reasonable hope for this speculator's situation is to sell enough to pay down the loans and get to a positive cashflow position -- before prices decline. Otherwise the borrowing will not work for much longer and the negative cashflow will lead to distress sales. Given the larger equity balance they could hold on for a while. However, this will magnify the problem as declining values and rising debt creates a bigger squeeze. The worst case scenario would be to wait and possibly be forced to sell at the market bottom. "Some people call it a pyramid, but I don't like to think about it that way"
Would not that which we call a rose, by other name smell as sweet? I suppose they don't like to think of themselves as FBs, but that doesn't change the facts. Who writes these people loans? I really don't understand. May in addition to your FB page, you could start a FL (Lender) page. Great page - been lurking for a while. And PLEASE, keep up the good work! Youyr blog is one of my favorite blogs. As a blogger myselg I totally understand the challenges of blogging,. Keep up the great work. 2)Are the fb despite theirbad financial decisions otheriwse intelligent individuals? - Hey, wanna buy a house? - Hey, do you have any spare change? I appreciate your efforts and the originality really shines through, unlike other related blogs that snag and collate other people's efforts, and the interesting reading is only found in the edited comments section. OMG! I'm speechless, and that's highly unusual for me. Yes they will be in FBs hall of shame. This reminds me of the investment scams that promise great returns. You take from one to pay the other while all the along the thing is imploding. The new breed of speculators believe negative cash flow is good. How will they handle depreciating property values? Can you say foreclosure? I have reading this for a while, and I have a couple of professional questions. 1. So FHB gets in over their head and files for bankrupcy. No savings, no investment property, just a lot of stuff and their primary residence. Now when they file assuming they can get the clean slate bankrupcy ( chap 7 ) does the mortgage go away? It wipes out credit card debt does it do the same to the outstanding balance? 2. It has been said that in the past when people got upside down that they left their keys at the bank. Is there a "I give up" form? They'll have a special section in the FB hall of fame. The women in the article said they don't want to call it a prymid, but it sure is a house of cards. Started lurking about 4 weeks ago and have been anxiously renting and watching the blood in the streets start to run in the Front Range of Colorado. Simplified "I give up" form. can we repost this on www.stupidpeople.com ? What happens when it is "discovered" that the borrowers lied about tenancy or income or whatever? Will the lenders be "shocked, shocked I tell you to discover gambling on the premises?" Leverage works both ways of course, multiplies equity exponentially as the market goes up and destroys it exponentially as the market goes down. With no margin for error and no source of income, I would not be betting on these lame horses. To the anonymous poster from the Front Range: can you post some info regarding the Real Estate situation there? I used to live in Denver. When I left nice loft condos were still going for $180 Grand in LoDo. Quite fascinating the way Americans are so carefree about taking "risks" to the degree that they do. This is the best RE story today. I'm sure she's not alone in her situation. I'm wondering if she is to the point that on her new HELOC applications if she counts the actual soon-to-be-credit-line amount as income. Love the Mr. Bubble cartoon. Also, very good Jenga analogy. I want to comment on something I see a lot of lately. People, who in the past, when moving up to a bigger house, used to sell the old one and move their substantial equity to the new, more expensive one. The problem is that now, many are taking cash out of their house and buying the new one and renting the old one. They go from a good equity position in one house to two highly leveraged positions, subjecting themselves to much more market risk. I am working with someone now, doing this with his high priced home, and after leveraging it to buy a much bigger one, his negative on the old house being rented is $3,500 per month! This is an extreme example in $million plus houses, but very common now. I understand this term to refer to a situation where you have an underwater mortgage on a home and where you are protected from a lawsuit in the event of foreclosure. Basically, you cannot be sued for the deficiency. Is this correct? You buy a home with 35% down, and later "cash out refi" some or all of your original down payment. Would the debt lose its "non recourse" properties then? What if you refi without taking out cash (like you want to go from a short term fixed rate to a longer term fixed rate). You buy a home with some kind of exotic Interest Only or 0% down or piggy-back type financing. Do these loans ever not have "non recourse" characteristics? You are failing to make payments on a mortgage and the lender is offering to alter the loan terms in some way (or make some new loan) to help make your payments more managable (sorry to be a little vague on this one) so they can avoid foreclosure. Could you implicitly or explicitly waive the "non recourse" protections that you originally had and thereby open yourself up to a potential lawsuit in addition to eventually losing the house? If you are foreclosed on an underwater mortgage, is there any circumstance where the deficiency, having been "forgiven" by the bank, has to be reported as income for tax purposes? Is "Non-recourse" the correct industry term? Are there shorthand names for legal statutes related to this subject that a person can keep their eyes peeled for in loan documents? This blog will be a temendous resource in the months and years ahead. Can you imagine the value that readers here will realize by having some inside knowlege of the lending business? I have met a fair number of people in the mortgage business that after a number of drinks have said the same things. They didn't/don't have the backbone to write a blog about it. Be careful with your employer. Sit down to review final documents and he pulls the paperwork back and proceeds to tell the about to be FB that in the strongest possible terms he suggests not to sign the loan. They almost always sign. 'Non-recourse' loan exemptions vary by the state. Non-recourse means the lenders money can be recovered by sale of asset against which it is loaned. in other words, if the loan is used to buy a home and you mail the keys to the lender in case you cannot make mortgage payments, all the lender can do is to sell the home and get whatever they can. if the sale price is less than the amount owed, they cannot come after your other assets or money in the bank. This exemption is limited by state laws. for example in Kalifornia, ONLY PRIMARY loan used to by the home in 'non-recourse'. if you 80/20, the 20 is not 'NON-RECOURSE', i believe. Also if you refinance the 80% even once, you loose the 'non-recourse' protection. that means after this if you send the keys back, they can come and get your car, dog, moeny in the bank, everthing except 401k/iRA. AGAIN THE ABOVE IS NOT A FINANCIAL ADVICE. Please consult a professional. you have filled a void in the bubble blogs. keep it up. I enjoy the humorous originality as well as the stories of FBs. I've been lurking for a few weeks here and there. Keep up the good work and thanks for having the balls to publish such a great blog. 2. I quit a great job with a major sportswear company a few years ago with dreams of making it big as a loan officer. It proved to be one of the worst mistakes of my life. I had an acquaintance who seemed to be making cash hand over fist along with the rest of his colleagues. I was given an opp to join "the firm" and packed my bags and moved back to "the OC". Unfortunately, I didn't do my "due dilligence" long enough before quiting my job of the past 4 years. I was pulled in by the excitment and hype of the $$$$ to be made. Soon after joining what will remain the "un-named firm," I was shocked at the tactics used by the brokers to get people into what seemed to me at the time to be "FB type" loans. Anyway, I didn't last but 2 months in that environment. I couldn't handle helping people become FBs. I wanted to sleep well at night. Anyway, It was a costly mistake and took me several months to get back to regular full time employment at near my previous wage - around 70K. Have been lurking here and decided to post since you asked and wanted to show some appreciation for your time and work. Great blog by the way. I work in Irvine and the people i work with don't seem to believe in the bubble. Just had a coworker on Tuesday tell me that I needed to buy since IT NEVER GOES DOWN! and since he believes Irvine is the new Downtown OC metropolis that will be like SF or NY soon but, again I beg, I ask where are all of these people coming from to buy everything down there......must be lots of homeless people out there these days I guess. I was then told by this coworker that everyone wants to live in IRVIVE and my rebutal was WOW, I huess no one wants to live in any of the other "EVERYONE WANTS TO LIVE HERE TOWNS". Anyhow, thanks again for your stories and hard work. Can you explain some of the loan products used? I just sold my house to a couple, who are financing the entire $790K with a 30-yr 5-2-2-1-x ARM, what does that mean? I think the rate on the lender's sheet says 6.5%. Are these people FBs? I sure hope their loan goes through - they are prequalified to much more. I'm getting out at the top. I just wanted to say that I love your blog! It's weird to read all of the AFB stories, since I work with a guy who helps his wife secure marginal mortgage loans on the side like the ones you mention. The stories he tells me about some of his FBs are really close to the stories posted here. One of his FBs got an I/O on a house and had to refinance to a neg AM before their first payment was due thanks to some "emergency..." Crazy stuff! Good for you! We sold our Sonoma "clunker" in March. It wasn't really a clunker, but it definitely wasn't worth a half-million either. Crazy, I tell you. We're rapidly on our way to financial freedom after leaving California. We have always been in good shape, (No Hummers for us, used Hondas are more like it.) but I never thought I'd be out of debt this early in life. The CFP we saw recently was shocked (in a good way) at our finances. He said, "This is great. I don't have to help you dig out of any holes. We can get right to the fun stuff!" He asked how we wanted to retire, and we told him we wanted to spend the last years of our lives at Sea Ranch, tide-pooling and whale-watching. And, you know what? We can and will do it! My point is, now that you have dumped the clunker, find a good financial planner and tell him/her your dreams. You'll be amazed at how empowering it is to have a plan. It's a good feeling, a great feeling. I wish you the best! Desi Dude's analysis of California law relating to the inability of a lender to go after you is inaccurate. The key when we are talking about non-recourse centers upon two possibilities. The first is seller carry-back financing. This paper is non-recourse, leaving the seller with the sole option of foreclosing on the property. The second relates to purchase money financing of residential real estate. Again it is non-recourse. So, when you buy a residence, and it is your typical 80/10/10 with a seller 10% carryback, you have no personal liability on either loan. When you buy a commercial building and there is a seller carryback of secured financing, again no personal liability as to that secured seller financing. Note however that foreclosures can have a negative impact on your credit score. my take was about home loans on residential purchases-owner occupied. It was not supposed cover anything else. 2)If you refinance, you loose non-recourse protection. Non-recourse loans include typical California purchase loans used to buy an owner occupied residence of up to 4 units. State Law protects borrowers from personal liability on a purchase mortgage for a home which they occupy at purchase. (If the borrower later converts the home to rental, he is still protected.) The State has put the risk on the lender; the most a lender can do is take back the house. This law applies to properties of up to 4 units, and applies only to loans used to purchase the property. Purchase loans include bank loans and seller carrybacks. Some cases allow the same protections for refinances IF there is no cash paid out to the borrower, or if any cash paid out is used for property repairs or improvements. If the loan falls within this statutory protection, it is a non-recourse loan. Other loans may be non-recourse by their terms. The tax consequences of foreclosure, deed in lieu of foreclosure, or short sale on a non-recourse loan are simple: the property is taxed as if it were sold for the total outstanding amount of the loan (or sales price, if higher). Taxability of the gain and deductibility of the loss depend on the nature of the property. Congrats on selling your house! And for getting over $500K for it :-) How does it feel? Ours really was a clunker-- we found out at the inspection that we were a year away from having to replace the roof, etc. Plus, my husband thought of the house as his "project" which never really got finished and never really gave me the chance to relax when I got home after a long commute. I had about a four hour a day round-trip commute to San Fran, and it was just awful. I was so glad to see the thing go ;-) Plus, I don't know if you had the same feeling I did about having a mortgage-- for me, the 30 year fixed huge (to me) payment ($2000.00) and huge debt (well, not that huge, really... My husband bought the house at 380K) hovering over my head felt like I was holding the weight of the world. Really, tempermentally, I'm much happier renting. We were far from being FBs, but it was still unnerving to me. We have a financial planner but weren't in any real position to do anything with the plan until July. And we're a bit lazy, so one of these days... ;-) But the feeling of urgency is off and I can breathe easily again. - bwrs are taking cash out for everything imaginable. Mortgage payments, other properties, cars, vacations, etc. What they SAY they are taking the money out for are: debt consolidation or home improvement. - yes, "smart" people are being caught up in this as well. after all, they see people that make less money buying 500k houses, so they feel if "they" can afford it on less money, then they will be fine. - the lenders won't be shocked. they sold the many of the loans...and they knew a lot of it was BS when they made the loans. See my post with the "stop mortgage fraud" pic at the top. That's all for now...need to get some sleep. It feels great! I have to say that we were in a pretty good place there in SoCo, with a five minute commute from RP to Petaluma and $1200 mortgage. We could have lasted a long time. But, you know what? The freedom of knowing we'll have a paid off house in just a couple of years is unbelievable. I miss the weather, though, and the beach, and the weather, and the city, and the weather, and the natural beauty, and my friends, and...did I mention the weather? Anyway, I wish you much happiness in the East Bay. It sounds like you made a good choice. Hi, I'm a lurker and I get the most enjoyment from your stories about people getting in way over their heads. The only suggestion I can think of is if you hear of anything related to people getting in trouble due to higher heating prices this winter. FB "We sort of count our equity loans as our income"
Judge "We sort of count your mortgage application as fraud. No bankrupcy protection for you. Door's on your left"
Thankyou so much for this site. I have been so depressed over the impossibly high cost of housing and the way it's been going up up and up-er. Not only do the things I read here give me hope that it may soon be going down down and down-er, I even get to laugh about it sometimes ( the bubble bath ad is T-riffic). God Bless All. The original "generic" link to that story now points to a different story. This oughta get you to the original article now. I'll fix the link when I get a chance! I have to say, after reading through this blog my old paid-for house, old paid-for furniture, and old paid-for pickup are looking really good! Hearing the stories on your site make me feel better about "missing out" on the housing boom. I was initially saddened about getting priced out of the market 2 1/2 years ago. Especially, since I never was never trying to buy a home to make a quick buck, but rather just in pursuit of the American Dream. It suprised me how property became such a hot commodity and people with no investment experience were throwing all their chips into it. Anyways, after considering myself priced out of the market in 2/2004, I quit my job, used some of my down payment to start my own company and am now making twice what I previously made. And, my old company wound up going out of business in 10/2004 meaning had I initially bought a home I wouldn've been out of work, stressed out about my mortgage payment and probably pulling money out of my equity and considering that "income". I also never would've had the burgeoning business which I have now. I am currently renting, but saving fistfuls of money. Getting priced out of the market was one of the best things that ever happened to me. Does anyone else have a story like mine? Does anyone know of a company called The Milli Group? They are nation-wide but have a strong presence in California - any info would be appreciated. 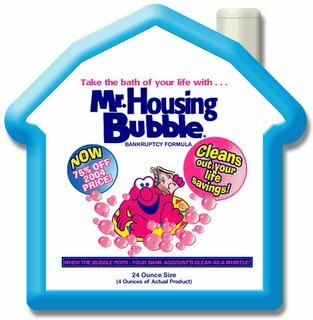 yAnother end to the bubble might come from two changes in consumer attitude. It isn't scientific but it is possible for markets incuding housing to just plain old get exausted. SUV sales are still off 30-60% even though the oil price spike is a memory. Then there are the other consumers, the buyers of MBSecs. I find it likely that they won't want any more paper at any price. This doubly worries me as we discussed earlier how lots of seemingly ordinary commercial paper is merely laundered MBSecs. wow gold opportunity! A careful analysis of what assets or supports are actually behind the loan market would probably dictate caution and lightening up on anything with exposure. Equity loans are debt not income.